The Christmas Palm Tree, scientific name Veitchia merrillii, is one of the most popular palms. 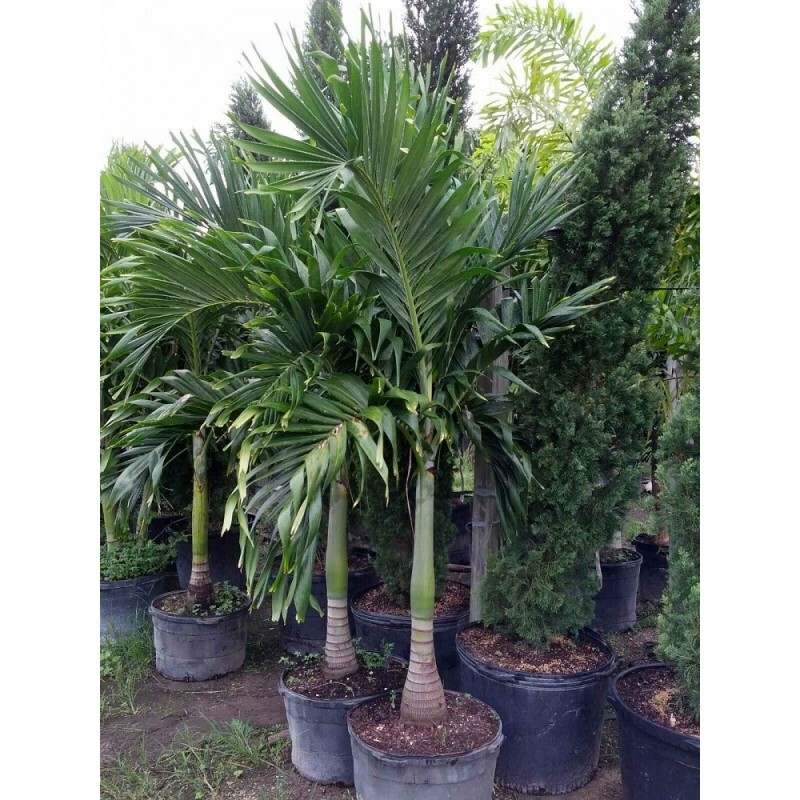 It has a lot of similar characteristics with Royal Palm Tree and sometimes is even called dwarf royal palm. Christmas Palms Trees are much smaller and are easier to manage in comparison to the Royal Palm Trees. Appearance: The Christmas Palm has smooth slender grey trunk that is slightly swollen at the base and ringed with old leaf scars. The Christmas Palm may be used alone or may also be planted in groups of two or three. Bright green crownshaft supports a crown of 10-12 pinnate, or feather-shaped, fronds. Short crownshaft is about 3ft long. Leaves are glossy, strongly arched, grow to a length of 5 feet with sharp-edged leaflets that are up to 2 feet long by 2 inches wide. Flowers/Fruits: During summer months the Christmas Palm produces light green flower buds that turn into creamy blossom. In December flowers are followed by green oval fruits that turn bright red as they ripe. Berrie-like fruits are 1 inch long and 1/5 inch wide. 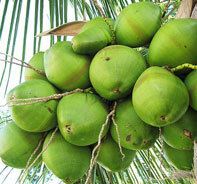 They hang in clusters looking like Christmas ornament, therefore palm’s common name is Christmas Palm. Growth Rate: Moderate to Fast. In the wild Veitchia merrillii is known to grow up to 25ft tall but in cultivation it usually doesn’t get taller than 10 – 20 ft and 5-10 ft wide. Outdoor/Indoor Use: Both. Cold Tolerance: Christmas Palm is not considered cold hardy and will not tolerate frost well. It can tolerate cold temperatures only down to 30F for a short period of time. Light Req: Full sun to partial shade. It likes full sun but can also grow in broken shade. Water Req: Moderate. The Christmas Palm is moderately salt tolerant prefers moist well drained soil. To avoid root rot don’t let it sit in water. It can tolerate drought for a short time when mature enough. Maintenance: Easy to Moderate. It does not require much maintenance. The only thing you need to do is to remove old dead leaves to keep it looking neat. To prevent nutritional deficiency, apply good quality palm tree fertilizer that has continues release formula twice a year during growing season.